If you’re a parent, please take the time to read this. ‘Screening tools’ are being used to score the behaviour, impairments, symptoms and social functioning of children and young people who are experiencing difficulties that have been erroneously labelled as mental health problems. Have you suffered from lack of concentration or restlessness? Have you experienced difficulties keeping up with your usual educational abilities? Have you been feeling in a low or anxious mood, or troubled by fears, obsessions or rituals? Have you been troubled by a lack of satisfactory friendships or bullying? When any child or young person answers these types of questions, they could find it difficult to escape being labelled as troubled or mentally ill. The questions cover a wide range of normal emotions and situations that every child and young person may go through when growing up, or which they may currently be experiencing. However, these emotions and situations when analysed by psychiatrists or other ‘experts,’ are turned into potential mental health problems. Parents should also know of another screening tool called the ‘Strengths and Difficulties Questionnaire’ (SDQ). 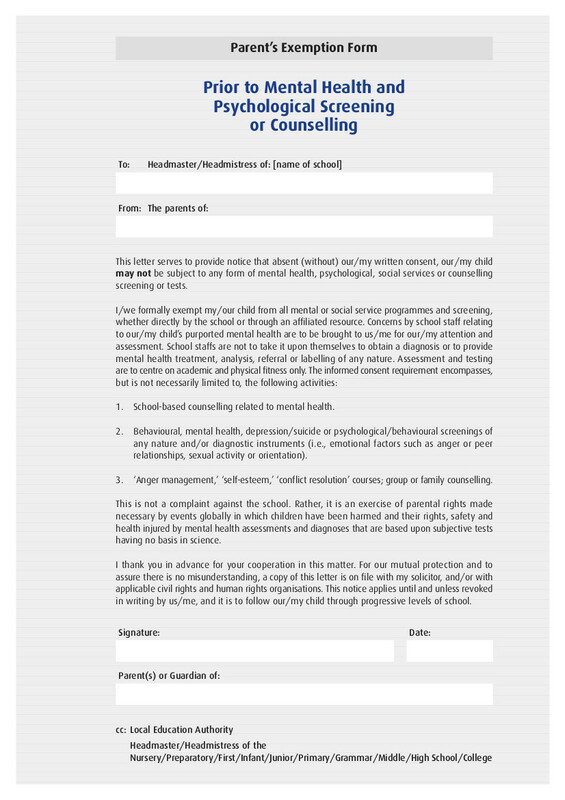 It is described as a brief behavioural screening questionnaire about 3-16 year olds. However, it contains invasive and evaluative questions about separation anxiety, specific phobia, panic/panic attacks, post traumatic stress, obsessions and compulsions, generalised anxiety, depression, irritability, loss of interest, deliberate self harm, troublesome behaviour, trouble with the police and just to capture everything, a category called “less common difficulties.” Children from 11 – 16 years are asked to fill out the survey themselves while carers or parents fill out the survey for 2 – 4 year-old children. Considerate of other peoples feelings? Restless or overactive cannot stay still for long? Often has temper tantrums or hot tempers? Often unhappy, downhearted or tearful? Nervous and clingy in new situations, easily loses confidence? Can’t think things over before acting? Again, it could be considered difficult to escape being labelled with some kind of mental problem when answering these questions. It is therefore important, as a parent, to be fully informed about the nature of these screening tools, and to know that there are self-rated questionnaires which may or may not be drawn to your attention. Parents should know they have the right to say no and to refuse to have their child tested. 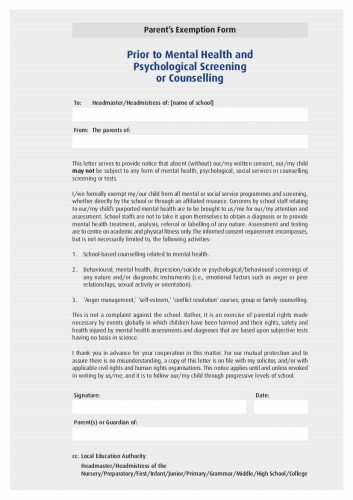 You can download and submit a Parent’s Exemption Form to their school, stating your child may not be subjected to any form of mental health, psychological, social services or counselling screening or tests without your written consent. Here are some more of the questions contained in the SDQ for other issues that have been redefined. Who are you particularly attached too? Overall, in the past month, have you been particularly worried about being separated from your (attachment figures cited in first question)? Have you often been worried either about something unpleasant happening to (attachment figure), or about losing them? Have you worried about sleeping alone? Were you like this by the age of 6? Are you particularly scared about any of the things or situations on this list? Storms, thunder, heights or water? Blood: Injections? Injury: set off by the sight of blood or injury, or by an injection? Other specific situations: lifts, tunnels, flying, driving, trains, buses, small enclosed spaces? Overall, do you particularly fear or avoid social situations which involve a lot of people, or meeting new people, or doing things in front of other people? Can I just check, have you been particularly afraid of anyone in the following social situations over the last month? Meeting a lot of people, such as at a party? Reading out loud in front of others? Writing in front of others? In the past month, have there been times when you have been very sad, miserable, unhappy or tearful? In the past month, have there been times when you have been grumpy or irritable in a way that was out of character for you? In the past month, has there been a time when you lost interest in everything, or nearly everything you normally enjoy doing? a) Have you often told lies in order to get things or favours from others, or to get out of having to do things you are supposed to do? b) Have you often started fights? c) Have you often bullied or threatened people? d) Have you often stayed out after dark much later than you were supposed to? e) Have you stolen from the house, or from oher people’s houses, or from shops or school? f) Have you run away from home more than once, or ever stayed away all night? g) Have you often played truant (bunked off) from school? The Adolescent Well Being Scale was devised to pick up possible depression in older children and adolescents and involves asking 18 questions about their thoughts and feelings and asking children whether they feel those thoughts or feelings some of the time, sometimes or never. It is used on children 7 to 16-years-olds. 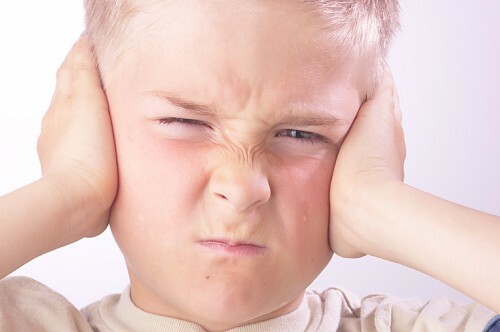 While it cannot be denied that some children and young people can be boisterous, argumentative or disruptive, or that they can experience difficulties in life, it is the codification of these difficulties as so-called mental illnesses that are of concern. Behaviour is not a mental illness, but the psychiatric profession has been gradually redefining behaviour to the point where many parents accept their children do have a mental problem and need treatment. As a repeat reminder, the first step for any parent is to be fully informed and once they are empowered with all of the information, they can protect their child by downloading and completing the Parent’s Exemption Form and submitting it to their child’s school.